Though the fairy tale of love, marriage and happily ever after may be just out of reach for ‘WAGS Miami’ star Darnell Nicole right now, she is a strong, talented woman ready to ignite her design career and set the fashion world on fire. Darnell’s rocky relationship with Reshad Jones, Miami Dolphins safety, has made for emotional episodes this season on her sizzling reality show, WAGS. An up close and personal look at the glamorous, competitive world of the elite and outspoken wives and girlfriends of sports stars who run Miami, Darnell has clearly become an audience favorite in this fast-paced series that’s on a ratings high. A Louisiana native, the lovely, long-legged Darnell grew up in Texas and eventually found her way to college in Georgia at Clark Atlanta University. Discovering her passion for the arts – dance, piano and acting – at a young age, she’s found success performing ever since. She considers herself a writer and rightly so as she has been leveraging her creative writing talents since a class changed her direction from Law school to the performing arts and inspired her to graduate from college with a degree in English. Initially a choreographer in Atlanta, she was trained in Ballet, Jazz, Modern, Hip Hop and Lyrical dance, though certainly a natural career choice for her, she quickly transitioned to writing and selling her own plays. Soon she began booking commercials as an actress, after studying professionally with renowned teacher Nick Conti, and even earned a few movie roles. She played the lead in Kiss The Bride supported by a cast including Darrin DeWitt Henson (producer and actor known for his initial hit, Soul Food), Reagan Gomez-Preston (Jerry McGuire) and Jedda Jones (Ray). By 2010, New York City called and Darnell arrived in the Big Apple ready to explore opportunities to act or write on a bigger stage. But before long, love took her to Miami as she re-connected with a former flame. Though far from typical in any way, she holds true to the dual nature of Pisces, the last of the Zodiac Signs. Pisces is symbolized by two fish swimming in opposite directions like Darnell herself, divided between love and work, acting, dancing and writing conflicting with traditional scenarios of marriage, especially to a celebrated athlete. With such abilities and a Pisces personality, comes volatility as well as calm. Sometimes as the sign dictates, a Pisces can be as dangerous as a shark or as harmless as a goldfish in a pond but always staying intently focused and independent. Where Darnell is concerned, WAGS fans saw, she was in love with Reshad but no matter how deep the connection, it was still vital to her to stand on her own two feet and feel empowered in her own career. Passion and drama on reality TV aside, one love is true in her life, her devotion to her three year old daughter Carson Cree. “Mommy” is the most important role for this talented actress, dancer, choreographer, writer and now fashion designer. Darnell being 5 ft. 9 in. believes that just as petites have their corner in the department store so should taller women. She is hard at work designing a collection that will fit these women of greater height; the average American women is 5 ft. 4 in. We caught up with Darnell in the midst of a winter storm here in NYC envying her sunny days in Miami. Like suntan lotion on warm skin, she exudes a welcoming presence, glorying in the ocean-side life as we shiver in the snow. MILLENNIUM: I see you still have a NYC area code on your phone, what’s that about for a Miami celeb? DARNELL: Can’t give up my “roots”! I used to live in New York City before I went to Miami. MILLENNIUM: Does the big apple call you? Will you ever move back? MILLENNIUM: So you’re saying there’s a chance? DARNELL: Maybe in the summer time! You know what…when I get those millions I’ll just commute back and forth you know?! New York is my first love and my heart. I’m not built for the winters though! MILLENNIUM: Keep those flip flops on! We’re bundled up in our Canadian Goose jackets to keep warm but we’re missing those sunny days. Summer can’t come back soon enough! So WAGS Miami has been airing on E! Entertainment with great success, even a spin off is in the works. How do you feel about this experience? DARNELL: Hesitates for a moment) Truthfully, it was a lot to absorb. Not at all what I was expecting. Took time to process what was happening and what the world was about to see. DARNELL: I thought it would be a piece of cake. I’d planned in my head to be going on the show knowing my thoughts, knowing my life. Saying to myself “this is my story line…I’m engaged, I got the family thing going…” Only guess what? I was incredibly surprised. It would be a boring show if our lives turned out exactly as we expected, there’d be no drama, no suspense. MILLENNIUM: This season was definitely an emotional roller coaster. Whether we were laughing at your hilarious one liners, getting fired up when you were dealing with drama, or crying as we watched you face disappointment in your relationship…wow, that’s a lot to live much less live it LIVE on camera. You were so real about showing the public, your viewers, what was going on with your life. Not hiding it, which must have been very difficult. DARNELL: I am most comfortable in my own skin. There are a few girls on the show that you can tell are wearing a mask. They choose to portray themselves one way when in truth, they are actually not much like their on camera personality. I can’t do that. I have too much in my head to try to remember who I am today vs. who I might be tomorrow. MILLENNIUM: You have this newfound independence. What keeps you driven? How do you stay tough and focused? DARNELL: It’s in me. I just have to be me. Everything is exploding for me right now. I finally have an outlet and it’s all falling into place. MILLENNIUM: Part of your karma must be who you surround yourself with, are we right? DARNELL: Absolutely. friends and family. Absolutely. I also have the best team. My manager is incredible and she works 24/7 to get things done. She is a hustler! MILLENNIUM: When the first season ended, did you know what you wanted to do? Were you looking to start designing your new line or just reflect on the show? DARNELL: I dove right in. It was an open door. Sometimes it’s hard to accept when God closes a door because you’re so stuck on that vision you have for your life. I couldn’t just sit back and think this time. I also have a little munchkin looking up at me. There are so many opportunities out there, but they are not there forever so the time is NOW to start taking advantage of them. Of course, I love that I have my blog up now so I can start writing again. MILLENNIUM: Your blog is on your website DearDarnell.com. What are you sharing with us there? DARNELL: My inspirations and the deep connection I have with my designs. I design everything and I hope people will be receptive. I just launched. Every time I post about what’s really important in my life, my site crashes! MILLENNIUM: Lots of traffic! That’s a good problem to worry about! I once saw you apologizing to your fans, they just can’t get enough of you! Your launch came with “Just Breathe,” which is a strong connection to how you have always lived your life. 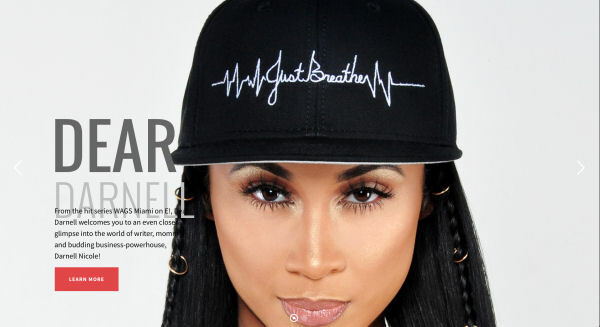 Love your clothing line, Just Breathe, it is HOT! (P.S. I need a hoodie!) Your perceptions of what this brand means to you are so insightful, I’m awed. So hoping you can reveal what gave you the idea to name your website, DearDarnell.com? MILLENNIUM: Writing down your thoughts is a helpful way to get things off your chest and articulate what you’re thinking. Where do you get letters from? DARNELL: All over the world! Fans from Africa to Australia. MILLENNIUM: Are you able to answer everyone? DARNELL: Yes I answer everyone. But I can’t go into my DM’s right now it is too much! On the website, there is also a contact section. It is an amazing feeling to know people understand where you’re coming from. We all want to be understood and to get that a thousand times over is just so great, I am so grateful for the connection to everyone out there. 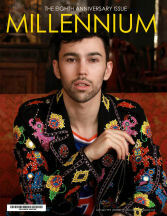 MILLENNIUM: When can we expect to see your fashion line launch? MILLENNIUM: Are you sure you and “sister” WAG, Ashley Nicole aren’t related? DARNELL: It is a little weird! Even our dads look a lot alike, our little brothers are almost identical, and our kids are two months apart so they think they’re twins. We’ve been through a lot together and we know each other for years…it’s very genuine. We knew each other for four years, but in this WAG World lifestyle, it’s so intense, four years is like double. MILLENNIUM: I can see how close that bond is. Is it hard to connect with people in the WAG world? DARNELL: Yes, definitely. Girls are in and out. The guys get hurt, traded or dropped. You can make a friend and then they get traded across the country. That can be your kid’s playmate, it’s really a lot. MILLENNIUM: How do you manage the friendships? DARNELL: I keep in touch with the real friendships I have made. We live in a good city for it. Most people make their home here (Miami) in the WAG world, definitely because of the weather. It’s a lot harder for other teams. 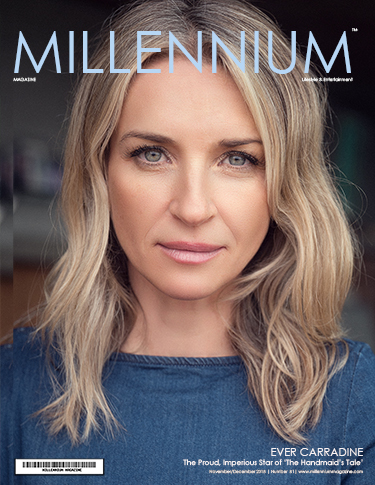 MILLENNIUM: How do you balance your life? MILLENNIUM: Congratulations on your second season! When do you start filming? DARNELL: We start filming again at the end of January 2017. I am so happy we are getting a second season! Last week we were told we would start filming in a few weeks. I’m excited to see who comes back on the show. MILLENNIUM: Please confirm that you are! DARNELL: Yes! You can count on me to be back. But it is going to be a bit scary to date again. I am going to have to see how that plays out. I am not trying to be with an athlete again. It wasn’t my thing before and still not really my thing. MILLENNIUM: For the show, do you have to date someone in the sports world? DARNELL: I don’t have to commit to anything! It’s funny though because there are men coming out of the woodworks! MILLENNIUM: Oh, I bet! Is it too much? DARNELL: They even call my manager! I’m too busy for that right now. 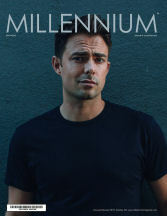 MILLENNIUM: But are you ready to date? DARNELL: I have tunnel vision right now. I don’t have the time or energy to put into someone else. I want to be financially set and that’s my number one priority. Of course, I enjoy the occasional dinner, drinks or whatever, but at the end of the night I can’t help but to think of what I have going on….my career and all the new projects there, the show and of course, my daughter. MILLENNIUM: What a boss…Are you a good cook by any chance? DARNELL: I like gourmet cooking. I cook every day. I will also be doing cooking blogs on my site. I am putting everything out there that God gave me. MILLENNIUM: What are you looking forward to in 2017? DARNELL: I’m excited for 2017! I wish to thrive and wrap my hands around every talent I have, from designing to dancing to parenting. Being financially independent and stable is all I want. DARNELL: Noooooo! You meet a lot of pretentious people. Not everyone is as rewarding as you’d hope they’d be. I’ve met amazing people in this WAG World and some not so amazing people. My experience with it all is consuming. But like any roller coaster, enjoy the ups and get through the downs, it all evens out into an incredible ride. Stay tuned for next season!